Governor Polis is working aggressively to get Colorado in compliance with federal air quality standards. 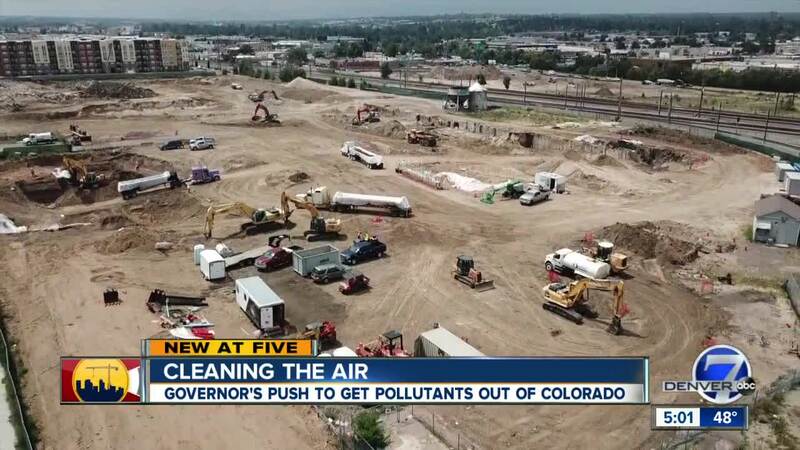 DENVER -- Governor Jared Polis is making a serious push to get Colorado compliant with federal air quality standards. On Tuesday, the Governor sent a letter to the Environmental Protection Agency (EPA) requesting for the state to withdraw its request to extend the 2008 Ozone National Ambient Air Quality Standard Attainment. “The extension was granted last summer and it would have given Colorado additional time to come into compliance with the standard,” said Jill Hunsaker Ryan, the executive director of the Colorado Department of Public Health and Environment (CDPHE). The Polis administration is now taking an aggressive approach to speed up some of its compliance deadlines and get the state in line with federal standards. “We believe that the interests of our citizens are best served by moving aggressively forward and without delay in our efforts to reduce ground level ozone concentrations in the Denver Metro/North Front Range non-attainment area,” the letter reads. It goes on to ask the EPA to work with the CDPHE to establish attainable goals to boost air quality standards. Colorado has fallen out of federal compliance for about seven years. Last year, the state was determined to be a serious air quality violator by the EPA. One of the biggest issues the state faces is a pollutant called ozone. “Last year alone there were 55 days when Coloradans were warned that exercise outdoors could be damaging to their health due to high ozone levels,” Ryan said. The irony is that in order to improve air quality standards across the state, more people need to be out of their cars. Colorado is growing rapidly and more businesses and residents means more cars and emissions. The state is grappling with ways to lower emissions as more and more people come to Colorado seeking new opportunities for themselves. She applauded Denver in particular for all it is doing to try to encourage people to leave their cars behind. The governor’s plan to clean Colorado’s air is three-fold; first, the administration is making a push toward transitioning the state to 100 percent renewable energy in coming decades. Lawmakers are also working on new oil and gas regulations. However, the administration is also working in partnership with the oil and gas industry and the stakeholders involved in order to find ways to bring emissions down. Finally, Governor Polis is working to move the state toward a zero-emission vehicles standard to pave the way for more electric cars. In the end, Ryan says cleaning Colorado’s air could end up saving the state and individual consumers money on health care costs. “Air pollution exacerbates asthma and cardiovascular disease and other health issues. So, if the air is cleaner, people are less likely to have their asthma exacerbated to where they may need to see a doctor or even have an ER visit. It’s a prevention strategy to have the population stay healthier and have people save money on health care,” she said. The administration is hoping to get Colorado up to federal standards by mid-summer of 2021.